Department of Pharmacology and Toxicology 1, Department of Pathology 3, Faculty of Veterinary Medicine, Ankara University, Ankara, Turkey. Department of Pharmacology and Toxicology 2, Faculty of Veterinary Medicine, Mehmet Akif Ersoy University, Burdur, Turkey. ABSTRACT: The genus Rhododendron has been widely used in traditional medicine. Rhododendron ponticum L. (R. ponticum) contains grayanotoxins with diterpene qualities. The aim of this study was to investigate in vitro cytotoxic and antiproliferative effects of R. ponticum L. extract on glioma in a rat glioma cell line (F98) and to calculate the amounts of grayanotoxins I and III. Rhododendrons were gathered from the Eastern Black Sea region of Turkey during the common flowering period. Their flowers were dried under suitable conditions, extracted with distilled water and lyophilized. The amounts of grayanotoxin I and III in the common rhododendron extract were determined by the chromatographic method. 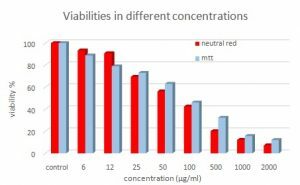 The cytotoxic and antiproliferative activities of different concentrations of the R. ponticum L. extract in mitochondrial (MTT) and lysosomal (Neutral red) assays was evaluated in glioma F98 cell lines. It was determined that the R. ponticum L. extract with a grayanotoxin I amount of 55.75 μg/kg and a grayanotoxin III amount of 7.4 μg/kg had a dose-dependent cytotoxic effect. 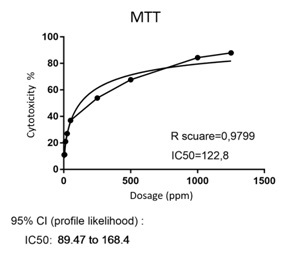 IC50 was found to be 122.8 µg/ml in the MTT and 79.61µg/ml in the neutral red (NR) assay. Previous studies show that R. ponticum L. may prevent high proliferative activity of tumor cells by its cytotoxic effects. The predictable amounts of grayanotoxin I and/or III may be preferred as a natural remedy for treatment of incurable glioma, which is one of the most common brain tumors in humans. Cancer cell line, Cytotoxic effect, Grayanotoxin, Rhododendron ponticum L.
INTRODUCTION: Rhododendron is one of many plants of the Ericaceae family, such as, Pieris, Agarista and Kalmia 1 - 2. The Rhododendron species are common in many countries such as Turkey, Spain, Portugal, Japan, Brazil, United States, China and Nepal. Five Rhododendron species grow naturally in Turkey, including R. ungerni, R. luteum, R. caucasicum, R. ponticum and R. smirnovii 3 - 6. Among them, R. ponticum (purple - flowered rhododendron) and R. luteum (yellow - flowered rhondendron) are commonly found especially in the Eastern Black Sea Region of Turkey 1, 6 - 7. R. ponticum grows mainly in the UK, Ireland, Bulgaria, Turkey, the Caucasus, and Lebanon, Spain, Portugal, Belgium, and France 8 - 10. Rhododendron family contains more than 750 plant species, most of which contain grayanine type tetracyclic diterpenes (grayanatoxins and romedotoxins) 11. The medical use of Rhododendron genus is limited because of its grayanotoxin content overall the World. Some species of this genus are used in Turkish and Chinese traditional medicine to treat lung, skin, muscle, gastrointestinal, and metabolic diseases 12 - 13. In addition, the flowers and fruits of R. tomentosum and R. molle were used as analgesic, anti-inflammatory, antimicrobial, antiviral, antifungal and insecticidal potential in ancient medicine (especially Chinese) 14 - 15. With regard to the plant extracts and isolated compound, in vivo and in vitro studies have indicated that flavonoids are mainly responsible for anti-diabetic, analgesic, anti-inflammatory activities while diterpenes exert toxic, insecticidal, and cytotoxic effects 13. Main cytotoxic mechanism of the grayanotoxins is carried out binding to sodium channels in cell membranes to increase the permeability of sodium ions excitable membranes 1, 16. Grayanotoxins are classified into four categories. Among them, most toxic ones are grayanotoxin I has been reported to possess in vitro cytotoxicity and / or selectivity towards cancerous hepatoma and leukemia cells 17. However, very little is known about the mechanism of action associated with the cytotoxic effect 13. R. brachycarpum extracts anticancer activity on human cancer cell lines (A549, AGS, Hep3B, MCF7) in the MTT assays 18. Recently, it has been demonstrated that R. luteum had antiproliferative effects on human hepatocellular carcinoma (HepG2) and colon adenocarcinoma (WiDr) 12. This study aims to determine the antiproliferative and cytotoxic effects of R. ponticum L. extracts collected from Ordu province of Turkey on cancer cell line (F98 glioma) and to quantify the grayanotoxin I and III levels, which are most cytotoxic ones. As a herbal therapeutic, R. ponticum which is commonly found in floral habitat of Turkey might be predictable a potential herbal therapeutic agent for incurable glioma amongst commonly central nervous system tumors. Sample Collection: During the flowering period of common rhododendrons, the samples were gathered from the Altinordu District of Ordu in Black Sea Region, Turkey Fig. 1. Voucher No: 60522 (Herbarium of Ankara University, Faculty of Forestry, Department of Forest Botany, Fig. 2). Plant Material and Preparation of Distilled Water (dH2O) Extract: The collected plants were identified after collection. It was dried under suitable conditions and then separated into leaf and flower Fig. 2. The flowers were powdered by milling and extracted using the maceration method with distilled water (5 g / 100 ml). The extract was first filtered through a 0.22 μM syringe filters (Sartorius Minisart® RC15 Syringe Filter 17761). The aqueous extract was lyophilized (Alpha1-2 LD Christ) to yield a crude aqueous extract. The lyophilized extracts were stored and packed in freezer bags at -20 °C until tested. Quantifications of Grayanotoxin I and III: The concentrations of grayanotoxins I and III in the common rhododendrons were quantified by the D.05.G468 method in a Chromatography Device at Marmara Research Center Food Institute of the Scientific and Technical Research Council of Turkey Fig. 3. Cell Line and Cell Culture: F98 cells (ATCC® CRL-2397TM) were maintained, cells were placed into 75 cm2 tissue culture flasks (BD Falcon, Rockville, MD, USA), and grown at 37 °C under a humidified 5% CO2 atmosphere in DMEM-F12 (Thermo Fisher Scientific, USA) with 2 mM L-glutamine, 10% fetal bovine serum, and 1% penicillin-streptomycin (10,000 U/ml penicillin and 10 mg/ml streptomycin) (Thermo Fisher Scientific, Waltham, MA, USA). Cell Viability and Cytotoxicity Assays: Cell viability was measured using MTT (3- [4, 5-dimethylthiazole-2- yl]-2, 5-diphenyltetrazolium bromide; thiazolyl blue) and Neutral Red (NR) assays. F98 cells were seeded in 96-well plates (3 × 105 cell /mL). After culturing overnight, cells were incubated with the test compounds at various concentrations of rhododendron’s lyophilized extract (6, 12, 25, 50, 100, 500, 1000 and 2000 µg/mL in DMEM-F12), the medium only and 0.1% Triton X-100 served as negative and positive controls for 24 hours. Each concentration was tested in triplicate. MTT and Neutral Red stock solutions were prepared at a concentration of 5mg/mL in PBS and 40 µg/mL in DMEM. MTT and NR test working solutions (15 μL for MTT, 100 μL for NR) were added to each well for 2 hours at 37 °C. After treatment, the solution was removed and Neutral red assay plates were washed with PBS. Then, they were incubated with 100 μL of a solubilizing solution (DMSO for MTT, Destain for NR) at 37 °C overnight. Cell viability was measured at 540 nm wavelength using the Spectra Max i3/i3x Multi-Mode Detection Platform (Molecular Devices, Sunnyvale, California, USA.). Cytotoxicity was assessed with regard to the untreated cell control which was set to 100% viability (MaxV). The dead cell control (Triton-X) was set to 0% viability (MinV). 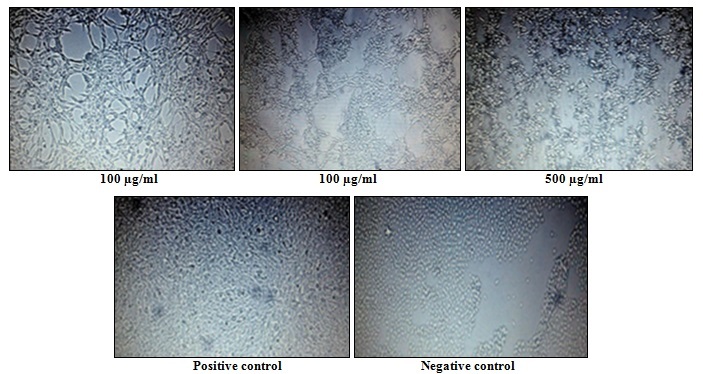 The degree of inhibition of the growth of extract treated cells is expressed as a percentage of the untreated cell control. The cytotoxicity formula is the following: Cytotoxicity (%) = [1 – (test – MinV) / (MaxV – MinV)] x100 19. Statistics: All study data were obtained from three independent experiments. IC50 values were calculated using the GraphPad Prism software, version 7.03 and the inhibition curves as regression analysis was obtained. IC50 values were calculated by the interpolation of experimental data. Evaluation of Cytotoxicity using the MTT and NR Assays: It was determined that the extract containing 55.75 μg/kg grayanotoxin I and 7.4 μg/kg grayanotoxin III had a dose-dependent cytotoxic effect. 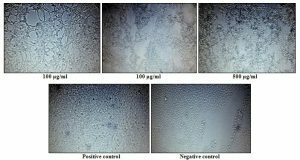 Evaluation of Cell Proliferation and Viability Rate: To determine the cytotoxic activities of R. ponticum extract, an in vitro assay was performed using rat glioma cancer cell lines (F98). 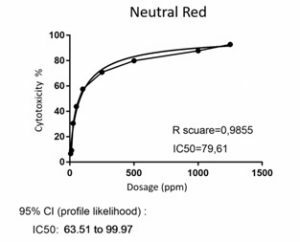 IC50 of the extract was found to be 122.8 µg/ml in MTT assay and 79.61 µg/ml in Neutral Red assay. The IC50 values demonstrated that the R. ponticum extract exhibited selective cytotoxic effect on the glioma cells Figs. 4 - 6. DISCUSSION: There is an increasing interest in the antiproliferative properties of natural products since they are believed to be non-toxic and are widely used as traditional medicines in the world 20. It is known that these plants have low toxic effects on mammals and they are used against inflammation, pain, skin diseases, common fever, and gastrointestinal system disorders in the traditional medicines of Asian, North American, and European countries 13. The extracts of Rhododendron species and some isolated bioactive compounds reportedly possess some anti- proliferative activities 12, 18, 21 - 23. In a study, R. brachycarpum exerted anticancer activity on human cancer cell lines such as A49, AGS, Hep3B, and MCF-7 18. Demir et al., (2016) showed that R. luteum had antiproliferative effects on human hepatocellular carcinoma (HepG2) and colon adenocarcinoma (WiDr) cancer lines. 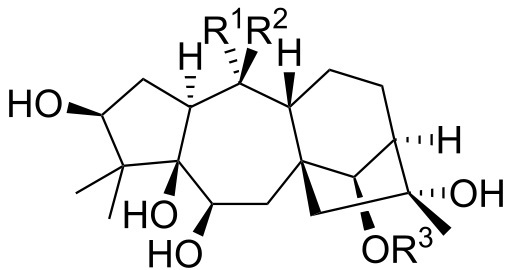 Grayanotoxins (GTXs), which are composed of most actively tetracyclic diterpenoid compounds of Rhodendron sp., are thought to be responsible for anticancer activity. The efficacy as an anticancer therapy is more related to the ability in initiation apoptosis or induction cell cycle arrest in cancer cells 13, 22 - 23. Grayanotoxins (GTXs) also cause the inhibition of all catalytically active mammalian carbonic anhydrase (CA, EC 4.2.1.1) isoforms, especially on cytosolic isoforms CAI and II 24. CAs appears to be almost ubiquitously expressed in living organisms. Sixteen CA isoforms have been identified in mammals, many of which are implicated in a wide array of physiological processes. These isoforms are important therapeutic targets in human pathological conditions because of their potential utility 25, 26. In this study, R. ponticum L. extract containing GTX I and III showed cytotoxic effects on F98 glioma cells, possibly by exerting catalytic activity on cytosolic CAs. Especially, the cytoplasms of glioma cells incubated 24 hr and at dosages of 6, 12, 25, 50, 100, 500, 1000, and 2000 µg/mL were degenerated. According to these results, the cell viability percentages were found with MTT 88.84%, 78.94%, 72.99%, 63.07%, 46.12%, 32.26%, 15.63%, and 12.04% in MTT assay and 93.38%, 90.83%, 69.44%, 56.17%, 42.42%, 20.06%, 12.18%, and 7.19% in NR assay, respectively. The degeneration was mostly of a hydropic one and/or involved acute cell swelling. Hydropic degeneration and acute cell swelling are known to be more related with impaired cellular oxygenation 27. Therefore, it has been mechanistically thought that increasing CO2 levels in the cytosol due to the absence of any catalytic activity induce degeneration in cancer cells. Our study for the first time demonstrated the cytotoxic effect of the R. ponticum extract on the cancer cell line by means of GTx I and III. In the NR test, GTx I and III found in R. ponticum extract reduced activity in mitochondria, which is the respiratory center of the cell, so it was obvious that acute cell swelling in glioma cells occurred due to disruption of cellular oxygenation in the cells. This suggests that R. ponticum can prevent cancer cell proliferation. According to the current results, R. ponticum may be a new and promising natural therapeutic agent for treatment of several cancers. Particularly, the anti-proliferative effect on glioma, an aggressive, common (80% of malignant tumors) central nervous system tumor in humans, might be a new remedy for cure. At least, survival time might be prolonged by combating of current compounds with cancer cells. When it is considered that the median overall survival of glial tumors is approximately 1.5 to 3.5 years, this therapy may provide a significant contribution to prolong survival of patients with central nervous system tumors. However, further in vivo experimental models are needed to confirm these anti-carcinogenic activities. Several clinical trials on cancer patients can be initiated after the comparative evaluation of the results of in vivo and in vitro studies with R. ponticum. CONCLUSION: In conclusion, as a herbal therapeutic, R. ponticum is considered highly useful because it is found abundantly in the natural environment of Turkey and processed with very low costs. CONFLICT OF INTEREST: The study has not been supported by any organization. The authors declare no conflict of interests. Mackay MB and Gardiner SE: A model for determining ex situ conservation priorities in big genera is provided by analysis of the subgenera of Rhododendron (Ericaceae). Biodiversity and Conservation 2016; 10:1007/s10531-016-1237-0. Usta A, Yayli B, Kahriman N, Alpay Karaoglu S and Yayli N: Composition and antimicrobial activity of essential oil from the flower of Rhododendron luteum Asian Journal of Chemistry 2012; 24(5): 1927–1930. Kaplan M, Olgun EO and Karaoglu O: Determination of grayanotoxins in honey by liquid chromatograpy tandem mass spectrometry using dilute-and-shoot sample preparation approach. Journal of Agriculture and Food Chemistry 2014; 62(24): 5485-5491. dx.doi.org/10.1021/ jf501560t. Yengil E, Akhan MM, Yengil D, Ozturkoglu HE, Silfeler I and Karakus A: Deli bal ile zehirlenen bir aile: Olgu sunumu. Türkiye Aile Hekimliği Dergisi 2013; 17(3): 134–136. 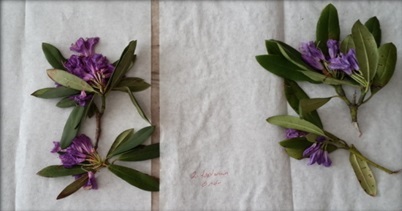 Clay DV, Goodall JS and Nelson DG: Effect of Imazapyr on Rhododendron ponticum. Aspects of Applied Biology 1992; 29: 287–294. Tatli O: The Black sea’s poison; Mad honey. Journal of Analiytical Research & Clinical Medicine 2017; 5(1): 1-3. Demir S, Turan I and Aliyazicioglu Y: Selective cytotoxic effect of Rhododendron luteum extract on human colon and liver cancer cell Journal of the Balkan Union of Oncology2016; 21(4): 883–888. Popescu R and Kopp B: The genus Rhododendron: An ethnopharmacological and toxicological review. 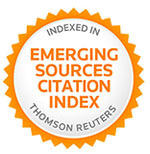 Journal of Ethnopharmacology 2013; 147(1): 42–62. Jesionek A and Łuczkiewicz M: Rhododendron tomentosum (Ledumpalustre). A Review of Traditional Use Based on Current Research Fitoterapia 2013; 85.10.1016 /j.fito 2013.01.013. 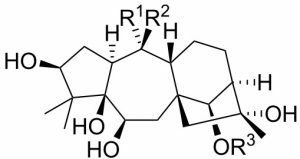 Zhou SZ, Tang C Ke CQ, Y SLG and Ye Y: Three new dimeric diterpenes from Rhododendron molle. Chinese Chemical Letters 2017; 10.1016/j.cc2017.02.020. Li Y, Liu Y-Band Yu S-S: Grayanoids from the Ericaceae family: structures, biological activities and mechanism of action. Phytochemical Review 2013; 12: 305–325. Jang GU, Choi SU and Lee KR: Cytotoxic Constituents of Rhododendron brachycarpum. Yakhak Hoeji 2005; 49(3):244–248. Byun KS, Lee YW, Jin HJ, Lee MK, Lee HY, Lee KJ and Lee JH: Genotoxicity and cytotoxicity in human cancer and normal cell lines of the extracts of Rhododendron brachycarpum Don leaves. Korean Journal of Medicinal Crop Science 2005; 13(4): 199-205. Ulukaya E, Ozdikicioglu F, Oral AY and Demirci M: The MTT assay yields a relatively lower result of growth inhibition than the ATP assay depending on the chemotherapeutic drugs tested. Toxicology in vitro 2008; 22(1): 232–239. Fauzi AN, Norazmi MN and Yaacob NS: Tualang honey induces apoptosis and disrupts the mitochondrial membrane potential of human breast and cervical cancer cell line Food and Chemical Toxicology 2011; 49(4): 871–878. Mani KP, Pardhu G, Ravinder S, Lakshmi V, Tejaswini K and Pradeep VB: Phytochemical Screening, Antimicrobial and amp; Anti Proliferative Properties of Rhododendron ponticum on Prostate Epithelial Cancer Cell Journal of Pharmarcological Science and Research 2011; 3(11): 1552–1555. Way TD, Tsai SJ, Wang CM, Ho CT and Chou CH: Chemical Constituents of Rhododendron formosanum Show Pronounced Growth Inhibitory Effect on Non- Small-Cell Lung Carcinoma Cell Journal of Agricultural and Food Chemistry 2014; 62(4): 875–884. Seephonkai P, Popescu R, Zehl M, Krupitza G, Urban E and Kopp B: Ferruginenes A-C from Rhododendron ferrugineum and their Cytotoxic Evaluation. 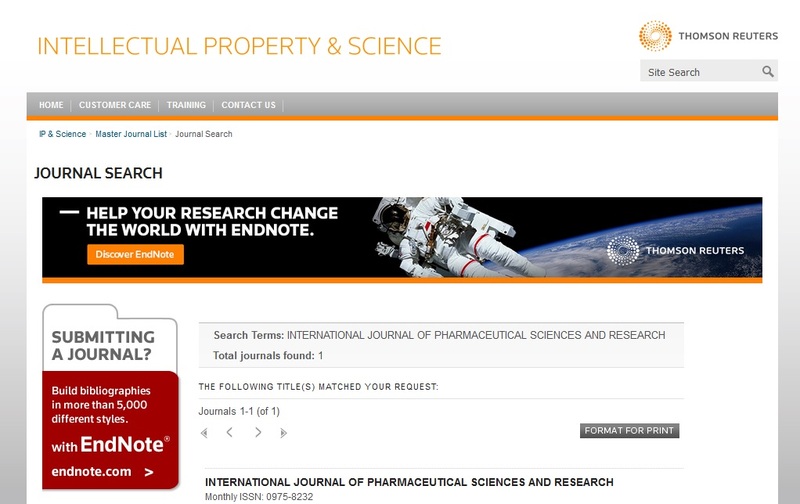 Journal of Natural Products 2011; 74(4): 712–717. Durdagi S, Scozzafava G, Vullo D, Sahin H, Kolayli S and Supuran CT: Inhibition of mammalian carbonic anhydrases I-XIV with grayanotoxin III: solution and in silico studies. Journal of Enzyme Inhibition and Medicinal Chemistry 2014; 29(4): 469-475. Mentese A, Erkut N, Demir S, Özer Yaman S, Sümer A, Doğramacı S, Alver A and Sönmez M: Auto antibodies against Carbonic Anhydrase I and II in Patients with Acute Myeloid Leukemia. Turkish Journal of Hematology 2017; 4274/tjh.2016.0341. Gilmour KM: Perspectives on carbonic Comparative Biochemistry and Physiology Part A: Molecular & Integrative Physiology 2010; 157(3): 193-97. Fretham SJB, Caito S, Martinez-Finley EJ, Giordano G, Costa LG and Aschner A: Neurotoxicology, Chapter 33. In: Hayes' Principles and Methods of Toxicology (Eds. Hayes AW, Kruger CL). Sixth Edition, CRC Press, USA, 2014; 1579-95. Authors Address: Department of Pharmacology and Toxicology, Faculty of Veterinary Medicine, Ankara University, Ankara, Turkey.